If you were at a networking event and a colleague introduced you to one of their friends, what’s the one word they would use to describe you? This scenario plays out all the time when we introduce two people, but really think about your personal brand for a second. 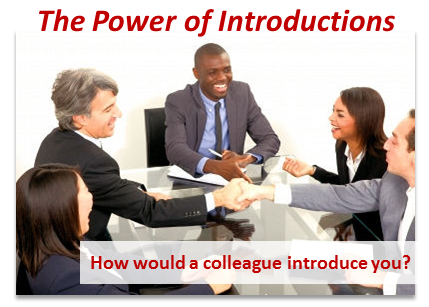 What one word would a colleague or business acquaintance use to describe you to a new person? Would they say something like, “Hey I want you to meet <yournamehere>, she’s great.” or would it be something more splashy? The “she’s great” sounds pretty typical, like your standard introduction. I read an insightful article on LinkedIn regarding personal branding and it talked about this typical introduction. How we describe people reflects their personal brand. So what one word would someone use to describe you? Or better yet, what one word would you WANT someone to use to describe you? Now of course, your one word doesn’t have to be something fancy or some creative title. You want your one word to be definitive and make you MEMORABLE. I admit, I did this exercise and it had me stumped. I thought about my personal brand and the ways people describe me when they talk to me. Words like “knowledgeable” and “high energy” came to mind as I replayed conversations I’ve had with clients. I’m wondering what people would say when they introduce me in a social setting. I’m going to have to work on this one! a signature word to epitomize your personal brand! Imagine what people would think about you as an entrepreneur if they could equate your business, work ethic, style and expertise with a signature word (or phrase). As you work to define this one word personal brand, consider your business style, your level of professionalism, and your marketing activity.Think about what you can do (or continue to do) to become that one word brand, in everything you do, personally and professionally. The next time someone introduces you, imagine what a powerful statement your one word brand will convey. A simple introduction, one word, can literally define your personal brand and lead to your next client!